A Karnaugh map is nothing more than a special form of truth table, useful for reducing logic functions into minimal Boolean expressions. Showing students that Karnaugh maps are really nothing more than truth tables in disguise helps them to more readily learn this powerful new tool. If you look at the input variables (A, B, C, and D), you should notice that only two of them actually change within this cluster of four 1's. The other two variables hold the same value for each of these conditions where the output is a "1". Identify which variables change, and which stay the same, for this cluster. For this cluster of four 1's, variables A and C are the only two inputs that change. Variables B and D remain the same (B = 1 and D = 1) for each of the four "high" outputs. This question introduces students to the Karnaugh reduction principle of detecting contradictory variables in a grouped set. If you look at the input variables (A, B, C, and D), you should notice that only two of them are constant for each of the "1" conditions on the Karnaugh map. Identify these variables, and remember them. Now, write an SOP (Sum-of-Products) expression for the truth table, and use Boolean algebra to reduce that raw expression to its simplest form. What do you notice about the simplified SOP expression, in relation to the common variables noted on the Karnaugh map? 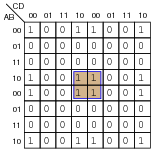 For this cluster of four 1's, variables A and B are the only two inputs that remain constant for the four "1" conditions shown in the Karnaugh map. 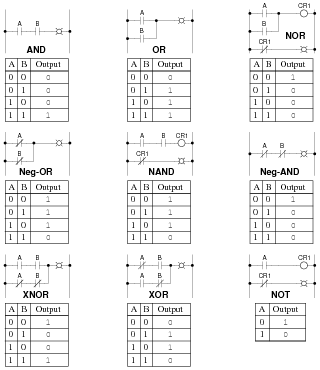 The simplified Boolean expression for the truth table is AB. See a pattern here? This question strongly suggests to students that the Karnaugh map is a graphical method of achieving a reduced-form SOP expression for a truth table. Once students realize Karnaugh mapping holds the key to escaping arduous Boolean algebra simplifications, their interest will be piqued! Arranged in this order, it is apparent that two of the input variables have the same values for each of the four "high" output conditions. Re-draw this Karnaugh map with the input variables sequenced in binary order, and comment on what happens. Can you still tell which input variables remain the same for all four output conditions? Looking at this, we can still tell that B = 1 and D = 1 for all four "high" output conditions, but this is not apparent by proximity as it was before. You could simply tell your students that the input variables must be sequenced according to Gray code in order for Karnaugh mapping to work as a simplification tool, but this wouldn't explain to students why it needs to be such. This question shows students the purpose of Gray code sequencing in Karnaugh maps, by showing them the alternative (binary sequencing), and allowing them to see how the task of seeking noncontradictory variables is complicated by it. 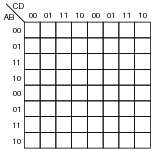 Fill in this map with the 0 and 1 values from the truth table, and then see if a grouping of four "high" conditions becomes apparent. Follow-up question: what does this problem tell us about grouping? In other words, how can we identify groups of "high" states without having to make oversized Karnaugh maps? The concept of bit groups extending past the boundaries of a Karnaugh map tends to confuse students. In fact, it is about the only thing that tends to confuse students about Karnaugh maps! Simply telling them to group past the borders of the map doesn't really teach them why the technique is valid. Here, they should see with little difficulty why the technique works. And, if for some reason they just can't visualize bit groups past the boundaries of a Karnaugh map, they know they can just draw an oversized map and it will become obvious! Looking at this cluster of 1's, the student identifies C as remaining constant (1) for all three conditions in the group. Therefore, the student concludes, the minimal expression for this truth table must simply be C.
Obviously, the answer given by the second student's Boolean reduction (AC + BC) does not match the answer given by the first student's Karnaugh map analysis (C). 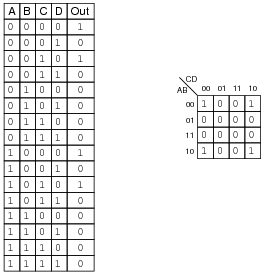 Somewhere, there must have been a mistake made in the first student's grouping of 1's in the Karnaugh map, because the map shown above is the only one proper for an answer of C, and it is not the same as the real map for the given truth table. Explain where the mistake was made, and what the proper grouping of 1's should be. The purpose of this question is to illustrate how it is incorrect to identify clusters of arbitrary size in a Karnaugh map. A cluster of three, as seen in this scenario, leads to an incorrect conclusion. Of course, one could easily quote a textbook as to the proper numbers and patterns of 1's to identify in a Karnaugh map, but it is so much more informative (in my opinion) to illustrate by example. Posing a dilemma such as this makes students think about why the answer is wrong, rather than asking them to remember seemingly arbitrary rules. State the rules for properly identifying common groups in a Karnaugh map. Any good introductory digital textbook will give the rules you need to do Karnaugh mapping. I leave you to research these rules for yourself! The answer speaks for itself here - let your students research these rules, and ask them exactly where they found them (including the page numbers in their textbook(s)!). 0 0 0 0 1 1 1 1 1 1 0 "0"
0 0 0 1 0 1 1 0 0 0 0 "1"
0 0 1 0 1 1 0 1 1 0 1 "2"
0 0 1 1 1 1 1 1 0 0 1 "3"
0 1 0 0 0 1 1 0 0 1 1 "4"
0 1 0 1 1 0 1 1 0 1 1 "5"
0 1 1 0 1 0 1 1 1 1 1 "6"
0 1 1 1 1 1 1 0 0 0 0 "7"
1 0 0 0 1 1 1 1 1 1 1 "8"
1 0 0 1 1 1 1 1 0 1 1 "9"
Identify adjacent groups of 1's in this Karnaugh map, and generate a minimal SOP expression from those groupings. 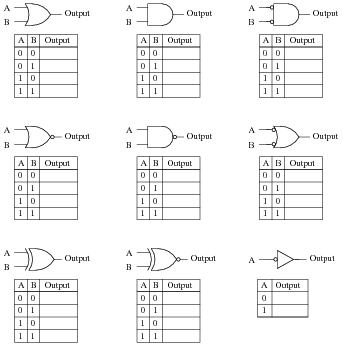 Note that six of the cells are blank because the truth table does not list all the possible input combinations with four variables (A, B, C, and D). With these large gaps in the Karnaugh map, it is difficult to form large groupings of 1's, and thus the resulting "minimal" SOP expression has several terms. With this new Karnaugh map, identify adjacent groups of 1's, and generate a minimal SOP expression from those groupings. 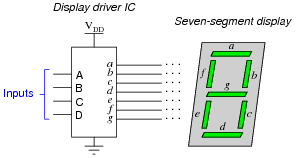 Follow-up question: this question and answer merely focused on the a output for the BCD-to-7-segment decoder circuit. Imagine if we were to approach all seven outputs of the decoder circuit in these two fashions, first developing SOP expressions using strict groupings of "1" outputs, and then using "don't care" wildcards. Which of these two approaches do you suppose would yield the simplest gate circuitry overall? 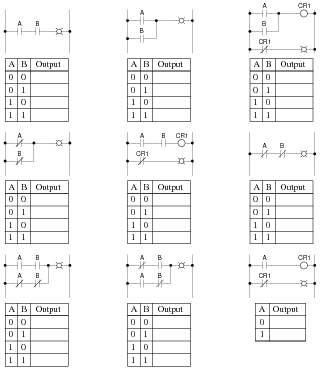 What impact would the two different solutions have on the decoder circuit's behavior for the six unspecified input combinations 1010, 1011, 1100, 1101, 1110, and 1111? One of the points of this question is for students to realize that bigger groups are better, in that they yield simpler SOP terms. Also, students should realize that the ability to use "don't care" states as "wildcard" placeholders in the Karnaugh map cells increases the chances of creating bigger groups. Truth be known, I chose a pretty bad example to try to make an SOP expression from, since there are only two non-zero output conditions out of ten! Formulating a POS expression would have been easier, but that's a subject for another question! Is it possible to use a Karnaugh map to generate the appropriate POS expression for this truth table, or are Karnaugh maps limited to SOP expressions only? Explain your answer, and how you were able to obtain it. Yes, you can use Karnaugh maps to generate POS expressions, not just SOP expressions! I am more interested in seeing students' approach to this problem than acknowledgment of the answer (that Karnaugh maps may be used to generate SOP and POS expressions alike). Setting up a Karnaugh map to see if a POS expression may be obtained for this truth table is not difficult to do, but many students are so unfamiliar/uncomfortable with ëxperimenting" in this manner than they tend to freeze when presented with a problem like this. Without specific instructions on what to do, the obvious steps of "try it and see" elude them. It is your charge as their instructor to encourage an experimental mindset among your students. Do not simply tell them how to go about "discovering" the answer on their own, for if you do you will rob them of an authentic discovery experience. One of the things you may want to have your students share in front of the class is their Karnaugh maps, and how they grouped common output states to arrive at Boolean expression terms. I have found that an overhead (acetate) or computer-projected image of a blank Karnaugh map on a whiteboard serves well to present Karnaugh maps on. This way, cell entries may be easily erased and re-drawn without having to re-draw the map (grid lines) itself. Ask your students to compare using a Karnaugh map versus using standard SOP/Boolean simplifications to arrive at the simplest expression for this truth table. Which technique would they prefer to use, and why? 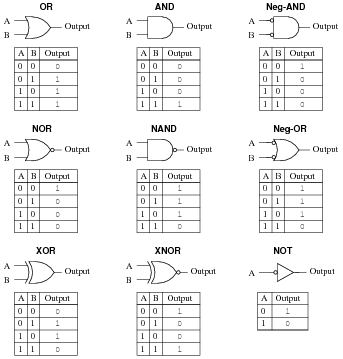 Challenge question: use Boolean algebra techniques to simplify the table's raw SOP expression into minimal form without the use of a Karnaugh map. This is one of those situations where an important group "wraps around" the edge of the Karnaugh map, and thus is likely to be overlooked by students. Follow-up question: although the relay circuit shown above does satisfy the minimal SOP Boolean expression, there is a way to make it simpler yet. Hint: done properly, you may eliminate one of the contacts in the circuit! Given the preponderance of 1's in this truth table, it is rational to try developing a POS expression rather than an SOP expression. However, your students may find that the elegance of Karnaugh mapping makes it easy enough to do it both ways! This is one question where you definitely want to have your students explain their methods of solution in front of the class, and you definitely want them to see how Karnaugh maps could be used both ways (SOP and POS). I have found that an overhead (acetate) or computer-projected image of a blank Karnaugh map on a whiteboard serves well to present Karnaugh maps on. This way, cell entries may be easily erased and re-drawn without having to re-draw the map (grid lines) itself.